Dye Penetrant Inspection (DPI) is used for detecting surface breaking defects such as cracking in non-porous materials such as metals, plastic or ceramics. It is ideal for detecting casting, forging and welding surface defects such as hairline cracks, surface porosity, leaks and fatigue cracks. We often use dye penetrant for weld inspections, as well as on assets where there is suspected cracking, such as columns, plates, attachments. DPI is fast and low cost. It can be used on both ferrous and non-ferrous materials, although for ferrous materials Magnetic Particle Inspection is recommended due to its sub surface ability. DPI can only detect surface flaws. 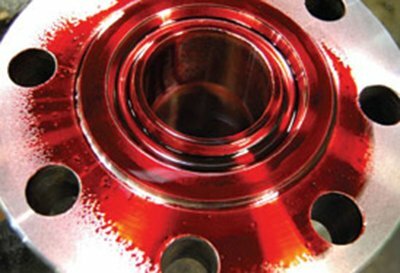 Dye Penetrant Inspection requires a clean bare metal finish for correct inspection. We recommend cleaning of welds to SA 2 ½ to a near white metal finish. This requires the removal of nearly all mill scale, rust, rust scale, paint, or foreign matter by the use of abrasives propelled through nozzles or by centrifugal wheels, to the degree hereafter specified. The NDT technician then applies dye on the part surface which penetrates into the cracks where it remains inside the material cracks even after the part surface has been cleaned. A developer, is applied after the cleaning of the part surface, extracts the dye from the material cracks. Due to this kind of “bleeding” the cracks become visible on the surface.